Is a court verdict enough to absolve Narendra Modi of the 2002 riots? Should we even care? There are two types of people who support Narendra Modi. The first type consists of ardent fans. They don't care about the 2002 riots. They don't care if Modi did not do enough to stop the riots or if Modi was actually the reason that the riots actually happened. In fact they actually started liking Modi after those riots. Here was a man that stood up for Hindu rights, they felt. This article describes one such lady. Then there is the other group. They like the way Modi operates. They like his decisiveness. They like his vision for the country. They like his support for industry. They are a little uncomfortable with Modi's role in the riots but they are satisfied that the courts have not found any evidence against him and as such, they believe he is innocent. I think the second group was looking for an alibi and they found the perfect alibi in the court's verdict. Honestly, if you think rationally, you cannot genuinely believe that Modi had nothing to do with the riots. It is fairly obvious that he caused the riots to happen. I am not even going to agree that his role was limited to not doing enough to stop them. I truly believe that he was instrumental in the riots happening. He egged the rioters on, encouraged them and provided state support to them. The lack of evidence does not mean the crime has not happened. You may not get punished because of the lack of evidence but you cannot say the crime never happened. I think every individual in this country who has the ability to think clearly and logically would agree with me that Modi is definitely responsible for the 2002 riots. Now if he is really responsible for the riots, should he be in the reckoning for the PM's post of the country? This is for you to decide. You could say that the riots are a thing of the past and Modi has now realised that this can never happen again. You could forgive him if you think what happened was wrong. Or you could argue that such a man should never lead the country. It would be too dangerous. It would also be an insult to the people who were killed in the riots. One huge problem for people who do not want to support Modi is the lack of a credible alternative. Who do we have against Modi? Rahul Gandhi? Arvind Kejriwal? A bunch of regional players who have no hope in hell of providing a stable government? Vishal Dadlani put it well when he tweeted: "Stuck between a moron and a murderer....what now, India!?" I think what's working really well for Modi is the lack of any opposition. Even though the BJP may not get the numbers on their own, the tie-ups with others might get them past the 272 mark in the elections. What might have been interesting to see is the presence of a good leader in the opposition. How Modi would have fared in those circumstances might have been a surprisingly different story! You echoed the feelings of many a silent observer, Kamal garu! I am one among them! I think the present brouhaha about Narendra Modi is uncalled for, for the simple reason that it leads to that one-man-worship which stares down at the very roots of parliamentary form of democracy! 2) "I truly believe that he was instrumental in the riots happening. He egged the rioters on, encouraged them and provided state support to them." - yes, many other also hold this view. but rather than just having a view these people should have testified in front of the Courts to prove him guilty. The very fact that they tried their level best but could not simply proves that it is a case of misdirected belief. 3) "The lack of evidence does not mean the crime has not happened. You may not get punished because of the lack of evidence but you cannot say the crime never happened." - Absolutely true. No one denies that the crime never happened..but was it a "crime" or a "riot" .. both are completely different things. The entire media and the activists never wanted to find out about the "Riots".. they were hell bent on proving that Modi was solely responsible for the "Crime". And that's where they got it wrong. By trying to put all the onus on Modi they took the attention away from Riots and put it on Modi's involvement in the "Crime". Rather than people debating how Gujarat govt failed to stop the Riots.. everyone was busy debating how only Modi was responsible for the Crime.. and when all the Courts declared him innocent they were caught off-guard and dumbstruck. 4) "I think every individual in this country who has the ability to think clearly and logically would agree with me that Modi is definitely responsible for the 2002 riots." - Not fair Kamal. Are we suggesting that more than 2/3rd of Gujarat who voted for Modi thrice over in the Assembly elections does not have the ability to think clearly or logically? Or, if 60% of today's youth are favouring Modi.. they lack logical / rationale thinking process. Not fair to make such a statement. 5) "Now if he is really responsible for the riots, should he be in the reckoning for the PM's post of the country? This is for you to decide." - Yes, it is for the people of this country to decide. And they are mature as have been proved multiple times in the past. In our country responsibility is determined by the Judiciary and the voting People.. not by mere here-say. If judiciary declares him innocent and people vote for him in mass he has all the right to become the PM. 8) "What might have been interesting to see is the presence of a good leader in the opposition…" - We have good leaders in other parties too.. unfortunately they are all happy in serving their masters rather than lifting their head up the muck to serve the country. The very fact that an eminent and respected economist like Dr Manmohan Singh feels happy to serve under a moron shows how much in depth our politics has gone down to. Also, no one stopped other parties to groom a good leader. Rahul is being officially groomed since the last 10 years. And AK was busy playing a T20 game rather than show his seriousness for a long drawn test match. Cant take away the credit from the winner by blaming on the lack of opposition. Opposition tried extremely hard.. and is still trying everyday.. it just goes to show the tenacity of the winner. 1) Do you really believe that if Modi did not want the riots to happen, the riots would have happened? Tell me honestly. There are videos (I will post the links a little later) of speeches given by Modi a few weeks after the riots that clearly prove that he was in favour of the riots. 2) I believe that he was behind the riots. However, the courts need evidence. I do not have evidence. But when I see he sequence of events, it seems as clear as day that he was responsible. As I said, not having evidence does not mean it did not happen. 3) The entire Gujarat government failed to stop the riots. I totally agree with you there. As the head of the government wasn't Modi responsible for this? 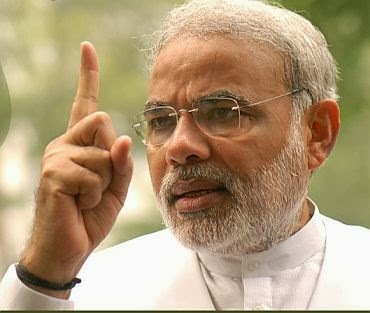 4) I am not saying that the Gujarat population or the people who support Modi are not thinking clearly or logically. Please read the post carefully. All I am saying that those who think clearly can see that Modi was responsible for the riots. I go on to say that despite this, some people choose to support him. I do not find fault with them for this. Please note this very important point. 5) I agree with you entirely that if people vote for him, he definitely has the right to become PM. Just like he has the undeniable right to become CM of Gujarat if the people of the state vote for him. I am nowhere suggesting that he should not become PM. All I am saying is that he is guilty of the Gujarat riots. Nothing else! 7) Dadlani has no evidence but like me, he believes Modi s responsible for the riots. 8) Any leader who serves his masters is not good. Dr. Manmohan Singh was totally ineffective as PM. Rahul Gandhi is a moron. Kejriwal has totally lost it. Where are the good leaders?? Today, unfortunately there is no one capable to stand in front of Modi! That is the point I am trying to make! P.S. It would be great if you identified yourself. Now you might argue that the video is fake etc. I really do not have any answer to that. To re-emphasize, I do not have a problem with you or anyone supporting Modi. All i am saying is I believe he had a role in the Gujarat riots. A court verdict is not sufficient for me to say he is innocent. Another striking fact is Maya Kodnani was an influential minister in his cabinet at that time. She has been found guilty and has been imprisoned. So has Babu Bajrangi. All this further strengthens the allegations against Modi. Do you really think that all this would have been possible without Modi's knowledge? How can a youtube video prove the complicity or innocence of any person in our country? Or a tweet by vishal-dadlani? In a vibrant democracy as ours only the Judiciary has the power to decide on the complicity or innocence of any person. Are we saying that this video was not shown to the Supreme Court while cases were running against Modi? The Court goes through countless pages of evidences, eye witnesses, investigation reports, innumerable such videos and many hours of cross questioning before coming to a decision about an accused's complicity or innocence. In our country we have multiple courts just to ensure that although justice is delayed, but never denied. That too in the past 10 years when Congress was at the power at the Centre and had used its entire CBI and IB machinery to get evidence against Modi and put him in docks. In case of Modi, the cases were also transferred outside Gujarat so that the state govt cannot interfere with the investigation process. And after all this scrutiny by the Hon Supreme Court of our country ... if we still believe in the words of some activists, or youtube videos, or tweets, or opinions and not with the judgement of our eminent Judiciary.. then I fear we are better off living in a banana republic rather than a vibrant democracy as ours that is ably supported by the four pillars of executive, legislature, judiciary and media. I so wish the rosy picture you paint of the four pillars of our democracy were true. Are you serious when you say that in our country justice is delayed but never denied? Really? The conviction rate in India is so low, it is a joke. I am not blaming the judiciary. All I am saying that is is far from effective. I am also not saying that the You Tube video or the Dadlani tweet proves anything in a court of law. A court would obviously require much more solid evidence. Evidence that will never be found. What evidence would exist of some instructions given in person in the closed confines of a cabin? Circumstantial evidence exists for sure. And it is enough for me and other like me to say Modi could have prevented the riots and he did not. He could have prevented the mass massacre of innocents and he did not. He clearly told the hoodlums who carried out the carnage that they had three days to do whatever they wished. Why wasn't the army called in on the first day itself? It is evident that he wanted this to happen. He wanted the Muslims to be 'taught a lesson they would never forget'. All I am saying is let us accept that he is guilty of not preventing the riots. Despite this, if you still want to vote for Modi, I am totally ok with it. It is up to you. This is democracy. But let us not fool ourselves by thinking that the court has absolved him so he had nothing to do with the riots. Point 1: "I do not have a problem with you or anyone supporting Modi" / " if you still want to vote for Modi, I am totally ok with it. It is up to you"
Point 2:"Are you serious when you say that in our country justice is delayed but never denied?" / " The conviction rate in India is so low"
Reply 2: How can the low rate of conviction lead us to a conclusion that Justice is denied? Justice involves both conviction as well as acquittal based on the Investigating process carried out, and it is highly juvenile to say that only Conviction means justice, while Acquittal means Justice denied. Investigative process is always done with the purpose to find the truth, not to convict or acquit someone. Conviction or acquittal is just an outcome of an investigative process. That brings me to my earlier point that thank god we are in a vibrant democracy and not a banana republic where only conviction of an accused implies justice. Point 3: "Evidence that will never be found." / " Circumstantial evidence exists for sure." Reply 3: The Courts looks at circumstantial evidences also before passing a judgement. And with 10 years of Congress rule the Centre had unleashed all the investigative & media forces at its disposal to get all sorts of evidences (hard + circumstantial) to nail Modi. Point 4: "Why wasn't the army called in on the first day itself?" Reply 4: Do you know that within the first few hours of the riots Gujarat govt requested Maharashtra, Rajasthan and MP govt to immediately send in police forces to aid Gujarat police.. and that all the 3 States CM's refused to send in their forces.. and is it a co-incident that all the 3 were Congress ruled States at that time? Point 5: "It is evident that he wanted this to happen. He wanted the Muslims to be 'taught a lesson they would never forget'." When the Muslims of Gujarat, whom you are saying Modi wanted to teach a lesson, have voted in large numbers for Modi in the last assembly elections and are openly supporting Modi .. many people who are outside Gujarat are still stuck in their belief and can't see the writing on the wall. Point 6: "All I am saying is let us accept that he is guilty of not preventing the riots." In law and order situations, it is the police leadership which has to respond and not the political leadership. Indian Constitution directs us to consider all accused as innocent unless proven guilty.. and here we are proclaiming someone as guilty after he is declared innocent. Let people who think Modi, or for that matter any other accused, is guilty file an appeal against the SIT verdict and prove him guilty.. if that is done I will be the most happy and readily accept his guilt. But just to shout at the top of their voice without turning it into action reminds me of the "Wolf, Wolf..." story that I heard in my childhood. 2. "How can the low rate of conviction lead us to a conclusion that Justice is denied?" The low conviction rate does not mean that the rate at which crime is happening in India is reducing. It simply means that the guilty are getting away! 3. "The Courts looks at circumstantial evidences also before passing a judgement. And with 10 years of Congress rule the Centre had unleashed all the investigative & media forces at its disposal to get all sorts of evidences (hard + circumstantial) to nail Modi. " A lot of questions have been raised about the way in which the investigation was carried out. For example, here is a quote from R. K. Shah, the public prosecutor in the Gulbarg Society massacre who resigned as the public prosecutor because he found it impossible to work with the SIT and further stated that "Here I am collecting witnesses who know something about a gruesome case in which so many people, mostly women and children huddled in Jafri's house, were killed and I get no cooperation. The SIT officers are unsympathetic towards witnesses, they try to browbeat them and don't share evidence with the prosecution as they are supposed to do." The video I posted above also has ample pointers on how the investigations were carried out. If this is the way the SIT behaved, I am surprised why they took so much time to give a clean chit to Modi! 4. "Do you know that within the first few hours of the riots Gujarat govt requested Maharashtra, Rajasthan and MP govt to immediately send in police forces to aid Gujarat police.. and that all the 3 States CM's refused to send in their forces.. and is it a co-incident that all the 3 were Congress ruled States at that time? " Well, to be honest, if Modi would have instructed his police officers to not stand as mute spectators when women were being gang raped and burnt alive in front of them, maybe the three states police force may not have been needed. 5. "It is evident from what? How does Kamal Shah know what Modi wanted, that people of Gujarat or the hon supreme court does not know? :) "
Sanjiv Bhatt was a senior IPS officer who was present in a meeting held at Modi's residence where Modi had said that Hindus must be allowed to retaliate. Now you may pick holes in Bhatt's affidavit. However, any such evidence presented from both sides can also be said to be untrue. For example, obviously Modi did not give a written order to this effect. It would have been an oral instruction. What other evidence can possibly be presented? 6. "This point scares me about the future of my country. Accept the guilt of someone who has been acquitted by hon supreme court?" Please see response to point 2. The constitution says innocent until proven guilty. That is only legally. I do not believe that unless there is proof, an accused can be considered innocent. We really cannot go by the SIT clean chit. The way the SIT has conducted the investigation leaves a lot to be desired. Again, people can argue that the SIT did a great job etc. etc. This debate can continue forever and forever. In the end, it boils down to what each one of us chooses to believe. In these days of trial by the media, witnesses that can be silenced, witnesses that can be created and all kinds of corrupt officers, justice is often a casualty. Based on my read of the events and the various news items that have appeared both online and offline, I have concluded what I have. The same goes for you as well. Wish you a Happy Holi as well!